Drop all charges against RNC protesters | Fight Back! Fight Back News Service is circulating the following call from the Twin Cites-based Anti-War Committee for an October 13 call-in day to demand that St. Paul officials drop the charges against RNC protesters. Call In Day on Monday, October 13th: Hold Police Accountable for Brutality and Unlawful Arrests! 818 people were arrested during the RNC protests. Please call these officials to demand that all charges be dropped! Please forward this email to others to spread the word and print off the flyer and distribute it to others! 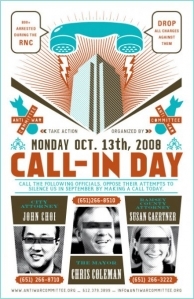 This call-in day is organized by the Anti-War Committee (612.379.3899, [email protected], antiwarcommittee.org). Mayor Chris Coleman misled the public and allowed St. Paul to become a militarized police state during the RNC. Riot police lined the streets of the permitted march on Sept 1. On Sept 4, the city-sponsored "public viewing area" across from the Xcel Center was closed to the public. Throughout the week, protesters were attacked with pepper spray, tear gas, concussion grenades, rubber bullets and police batons. Coleman called the actions of police "nothing short of heroic." Call Mayor Coleman to demand that police be held accountable for their brutality at the RNC and that all charges against protesters be dropped! Ramsey County Attorney Susan Gaertner is responsible for prosecuting everyone charged with felonies at the RNC including 8 people who are facing over 7 years in prison on trumped up charges of terrorism. Gaertner, who's running for governor in 2010, is prosecuting the RNC 8 strictly for their political beliefs and affiliations. Call her to demand that all charges be dropped now! St. Paul City Attorney John Choi is in charge of prosecuting all RNC-related misdemeanors. He has referred to RNC protesters as outsiders who wanted to "create mayhem." On Sept 4th, nearly 400 people were arrested for unlawful assembly after riot police blocked every route to the Xcel Center. The vast majority were Twin Cities residents who were protesting the war in Iraq. Call Choi to demand that all charges be dropped now!